This article is the second installment of a five-part series on foods you must have in summer. Over the next three weeks, we’ll be rolling out a new story on a specific region of the U.S. each week, so be sure to check back for the latest every Friday. We couldn’t include a mention of every local food and eatery, but we would love to hear about your personal favorites in the comments below. Popular regional foods often come with a tale or two on the side—especially in the historical mid-Atlantic region. From spirited immigrants who reinvented Old World classics to trendy city shops serving gourmet versions of childhood desserts, the legends behind these classic East Coast favorites are almost as pleasing as the foods themselves. Best enjoyed (and often only served) during summer, the following mid-Atlantic staples are as storied as they are scrumptious. Here are eight celebrated eats to enjoy on your summer vacation in the mid-Atlantic. "Summer isn't summer without blue crabs," declares The Baltimore Sun. In the Chesapeake Bay—the most biologically diverse estuary in the United States—fresh blue crabs (also known as Maryland crabs) are available primarily in the summer months. From April through November, crabbers catch the clawed bottom-dwellers in the warmer waters off the coast—the harvest generally begins when ocean temperatures reach about 58 degrees. During crab season, waterfront restaurants, crab houses, and seafood shacks along the mid-Atlantic coast prepare the fresh crustacean countless ways: as savory breaded cakes, steamed and splashed with butter, or baked and puffed. Soft-shell crabs are sauteed in white wine. The meat from just-caught crabs is baked with cheese and served as a hot dip alongside crusty bread. Although recipes vary, Old Bay seasoning, which was invented in Baltimore, is the crucial ingredient common to almost every blue-crab concoction. Where to Go: Seafood festivals in Maryland, including the Havre de Grace Seafood Festival, Cambridge's Seafood Feast-I-Val, and National Harbor's Chesapeake Crab and Beer Festival, are abundant with whole blue crabs served on newspaper-covered picnic tables or crabmeat piled onto toasted rolls. Virginia has its share of seafood fests too; find a list of them here. Go crab-shack hopping in Cambridge, Maryland, home to the self-proclaimed oldest working crab-packing house in the world, The J. M. Clayton Company; while in Cambridge, be sure to grab a bite at the iconic Waterman's Crab House. In summer, fries are best served in buckets, with lots of salt—both in the air and on the spuds. What makes a boardwalk fry different from the French kind? Many boardwalk purveyors offer distinct variations: with skin, without skin, straight, crinkly, with Old Bay seasoning, a side of Cheez Whiz, or a dollop of ketchup. Typically, though, boardwalk-style fries are cut from fresh potatoes by hand. And they're often blanched prior to their final fry. Most importantly, they're eaten on a boardwalk under the summer sun, amongst friends and hungry seagulls. Where to Go: There is, of course, the big Boardwalk Fries franchise, which originated in Ocean City, Maryland. To think outside the mall, visit one of these less-mainstream beach-town spots: Thrasher's sells its thick-cut fries in seaside towns in Maryland and Delaware, and Curley's Fries in Wildwood, New Jersey, serves sweet homemade lemonade with its piping-hot, squiggly potatoes. Where to Go: The best place to sip on a vintage soda-shop drink is in a vintage-style shop, of course. Historical Eisenburg's Sandwich Shop in Manhattan's Flatiron District is celebrated for its classic egg creams, which cost $2 each. Or grab an egg cream at Gem Spa, a famous newsstand in the East Village that has been pouring the fizzy drinks for decades. This ice-cold summer staple was first created in the Pittsburgh region—in Latrobe, Pennsylvania, to be exact. (Although a few other towns also lay claim to this credit, the National Ice Cream Retailers Association backs up Latrobe as the official birthplace of the dessert.) In 1904, clever pharmacist David Strickler of Latrobe combined scoops of chocolate, vanilla, and strawberry ice cream and garnished them with pineapple, chocolate, and strawberry sauces, plus chopped nuts, maraschino cherries, and a swirl of whipped cream, and rested the sweet, syrupy combination atop a halved banana. Strickler even made a boat-shaped glass dish to accommodate his colorful ice cream confection. Where to Go: On August 23, a state historical marker honoring the creation of the banana split in Latrobe will be unveiled during the Great American Banana Split Festival. According to TribLive.com, festival events include a "banana-peeling flash mob" and a "yellow-tie gala." In nearby Pittsburgh, visit the soon-to-be-reopened Klavon's Ice Cream Parlor, which features original marble soda fountains and art deco chandeliers and serves ice cream from Penn State Creamery. 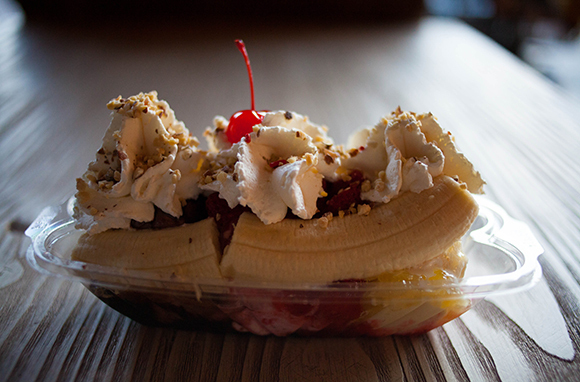 Klavon's officially opens its doors on National Banana Split Day (August 25). You may hear locals order "wooder ice" in Philadelphia, where queues snake around the block for cones and cups of the frozen sweet treat during summer months. The dessert, made from crushed ice, sweetener, and flavoring, is also known as Italian ice. It's a classic East Coast treat from the first day of spring—when popular water-ice chain Rita's gifts free cups of the stuff to the world—through fall. Flavors range from the classic (strawberry, lime, cherry) to the kooky (Swedish Fish, Starburst Strawberry). Mix your ice with custard to enjoy a smooth, creamy, and icy mouthfeel. 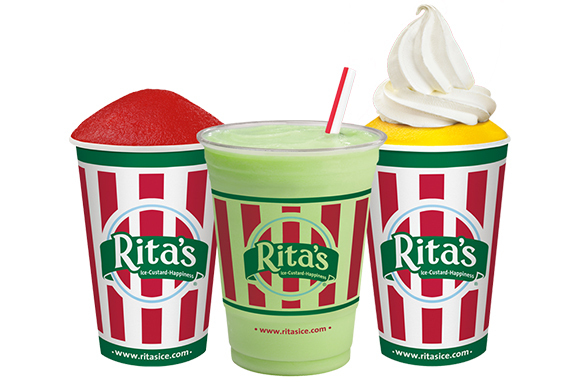 Where to Go: Grab water ice at the ubiquitous East Coast chain Rita's, which was founded in the Philadelphia region and is franchised across the country. Although it's now a national chain, Rita's is generally considered a local establishment by residents of the Philly region. The perfect portable sustenance for travelers touring cities, watching ball games, enjoying summer fairs and festivals, or eating on the beach, hot dogs are a wildly popular treat in the mid-Atlantic region. Rumor has it they were first sold in North America from a street cart in 19th-century New York City. Depending on where you're dining in the region, toppings and meats vary. In West Virginia, dogs are often served with mustard, a chili-like sauce, slaw, and chopped onions. Italian hot dogs, popular in New Jersey, are topped with peppers, onions, and fried potatoes and folded in Italian bread. And in the Big Apple, street-cart vendors dish out all-beef dirty-water dogs topped with your pick of toppings, from relish to spicy mustard. Where to Go: Nathan's Famous, founded in 1916 in Coney Island, is a classic choice. Visitors to New York might also want to stop by the popular Papaya King chain for an affordable frank sold alongside fresh juices or grab a hefty 15-bite beef hot dog at the Brooklyn Diner in Midtown. In Newark, New Jersey, Dickie Dee's is famous for its Italian-style hot dogs piled with potatoes, peppers, and fried onions. Finally, West Virginia's annual summer Hot Dog Festival, which takes place at the end of July, is the place to be for hot dog-eating contests and West Virginia-style frankfurters galore. Served at countless boardwalk candy shops in mid-Atlantic beach towns, sticky saltwater taffy makes an excellent seaside snack or shore souvenir. Fralinger's claims it was the first shop to popularize the chewy wrapped taffy—although the confection was reportedly invented by an Atlantic City boardwalk vender in the 19th century. Despite its name, the taffy is not made with salt water; it's a strictly sweet treat crafted from sugar and oil, primarily. Beachgoers can buy saltwater taffy in an array of colorful, fun, and often fruity flavors, from strawberry to spearmint to root beer. Where to Go: In Atlantic City, head to famous Fralinger's for a taste of the original taffy. Shriver's of Ocean City, New Jersey, sells classic flavors in addition to chocolate-covered and sugar-free styles. And Dolle's in Ocean City, Maryland, is a locally loved purveyor of house-made saltwater taffy, which it has sold since 1910. According to some sources, Margaret Thatcher helped invent soft-serve ice cream (also known as frozen custard) when she trained as a chemist for a food manufacturer in the U.K. 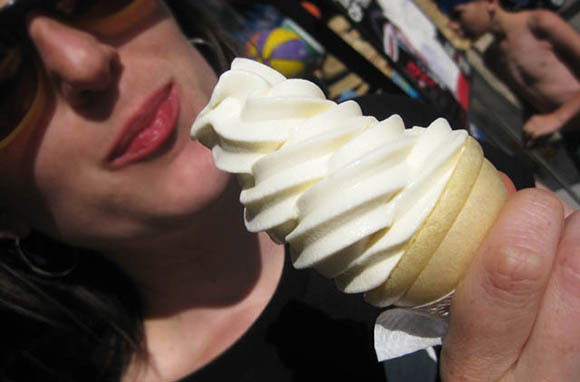 While we aren't entirely sure if this story is more folklore than fact (there's a bit of a debate about it), we do know that soft-serve has become a classic beach treat on this side of the pond. The neatly swirled ridges of light and fluffy frozen cream are as popular as fries and frankfurters on boardwalks from the Jersey Shore to Coney Island. Where to Go: Kohr Brothers is a famous custard source, serving the twisted treat in select beach towns along the East Coast and on Coney Island. Or go highbrow at New York City establishments such as Dessert Club, ChikaLicious, where you can sample soft-serve garnished with fresh-fruit puree or toasted pistachios. Be sure to check back with us next Friday for the third installment, Foods You Must Have in Summer: Midwest.